What's wrong with this picture: There's a civil war in Syria between the Shia/Alawites versus the Sunnis. On Tuesday, Russia, Iran and Turkey signed a peace agreement. The peace talks were held in Astana, the capital city of Kazakhstan. 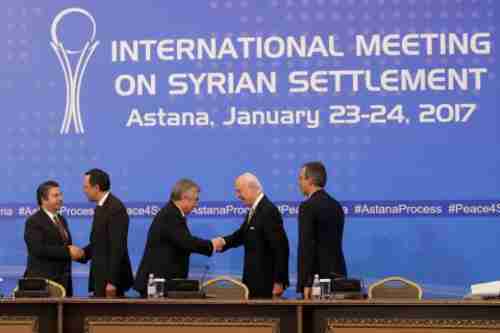 Syrian civil war peace talks in the past were held in Geneva, so having these talks in Astana gives that "this time it's different" feeling to the meeting. Another reason it's different is that the United States was not invited to the peace talks, largely because Iran opposed having the US present. However, the US was permitted to have an observer, and sent George Krol, the U.S. ambassador to Kazakhstan. The US issued a statement saying that it welcomed any "actions that sustainably de-escalate violence and reduce suffering in Syria." However the main reason, according to analysts, that this time it's different is that Russia is making it clear that it's willing to enforce a peace in Syria, so that it will get the credit for bringing about peace. In fact, Russia is so eager to enforce a peace that on Tuesday, for apparently the first time ever, Russia publicly bashed Syria's president Bashar al-Assad for breaching the ceasefire and lying about it. This has to do with a region called Wadi Barada in the suburbs of Damascus, that's under the control of anti-Assad rebels. Al-Assad's forces, aided by Iranian-backed Lebanese Hezbollah forces, have been breaching the ceasefire, attacking the anti-Assad rebels around Wadi Barada. Al-Assad claimed that it was al-Qaeda forces that were attacking the rebels, but the Russians called him out, essentially calling him a liar. Readers may recall that in 2015, al-Assad's army was close to complete collapse, and was only saved by massive Russian intervention. This was confirmed on Tuesday by Russia's foreign minister, Sergei Lavrov, who said that al-Assad and Damascus itself were only three weeks away from falling, which was prevented only because the Russian air force came and saved him. It's almost hard to believe, but we're seeing "proximity talks" again. In Astana, the al-Assad representatives were supposed to meet face to face with the anti-Assad rebel representatives. On Monday, they all sat around a nice oval table, so they could negotiate. So then the lead rebel negotiator, Mohammed Alloush, called the Syrian government a "bloody, oppressive regime" that forced Syrians to choose between "the terrorism of Bashar and the terrorism of ISIS," implying that al-Assad is worse terrorist than ISIS. Syria's lead negotiator, Bashar Jaafari, responded by calling Alloush the head of the "armed terrorist groups� delegation." So that was the end of the face to face talks between the al-Assad and rebel representatives. After that, they were put into separate rooms, and the farcical "proximity talks" started. I described how this works in the context of the January 2014 peace negotiations. Instead of talking to each other, a mediator carries messages back and forth between the two sides, in the hopes of reaching an agreement that way. Let's review. Last year, al-Assad's military, supported by overwhelming destructive force provided by Russia and Iran, was going to destroy the city of Aleppo. That was going to end the war because it would demoralize the opposition groups and jihadists so they would lose interest in fighting, and would go home. Well, nobody is talking about the destruction of Aleppo as "history in the making" any more. It was pure fantasy by al-Assad. Al-Assad destroyed Aleppo, but nobody seems to have gone home. There's a ceasefire in effect, but how long before it falls apart? I've been writing about this war for years. 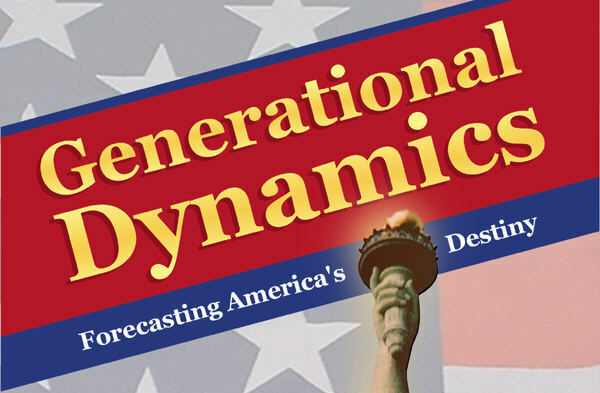 Syria is in a generational Awakening era, and this war should have fizzled within a year. But Bashar al-Assad's goal is extermination of Syria's Sunnis, as I've been describing for years. It's worth remembering how we got here. The civil war in Syria was caused by al-Assad when he unleashed his army and air force against peaceful protesters in 2011. Up to that point, Turkey and Saudi Arabia were friendly with al-Assad. Things really turned around in August 2011, when al-Assad launched a massive military assault on a large, peaceful Palestinian refugee camp in Latakia, filled with tens of thousands of women and children Palestinians. Al-Assad's unprovoked attack on this refugee camp, and the slaughter of thousands of Palestinian women and children, drew young jihadists from around the world to Syria to fight al-Assad, resulting in the formation of the so-called Islamic State (IS or ISIS or ISIL or Daesh). Sunnis in Syria itself turned against al-Assad, forming either "moderate" rebel militias or joining the jihadist Al-Nusra Front. Al-Assad is responsible for displacing millions of Syrians, including over a million that have flowed into Europe as refugees. So let's suppose that the Astana peace negotiations "succeed" in some sense, and the ceasefire continues for a while. What's going to happen when Syrians begin peacefully protesting again? Is al-Assad going to ignore it this time? How long will Russia's military be willing to continue spending blood and money to enforce the ceasefire?